This year, I’ve decided to do the 10 x 10 board game challenge. For those of you who don’t know, the challenge is simple: Over the course of a year, play 10 games 10 times each. It’s a lot more difficult than you think!! 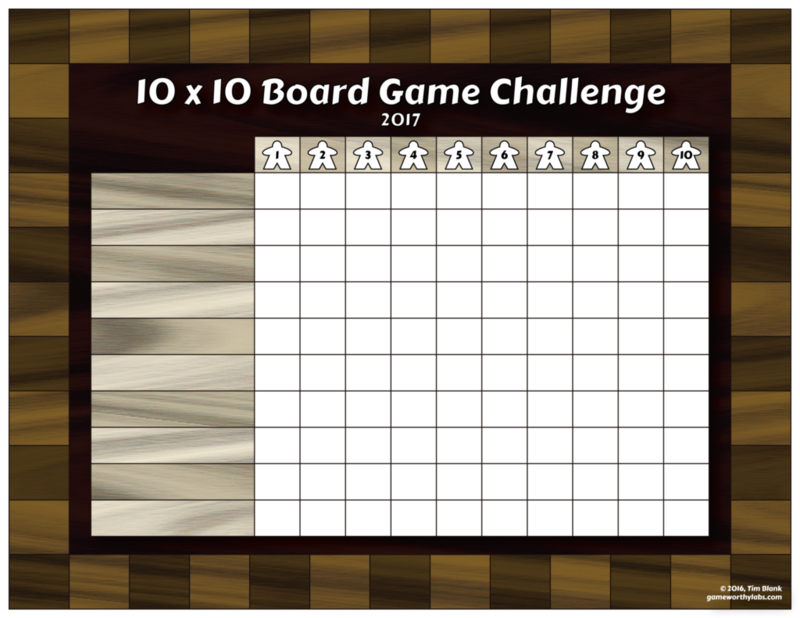 For those of you who’d like to do the challenge as well, click the image below for a printable version of the 10 x 10 board game challenge. 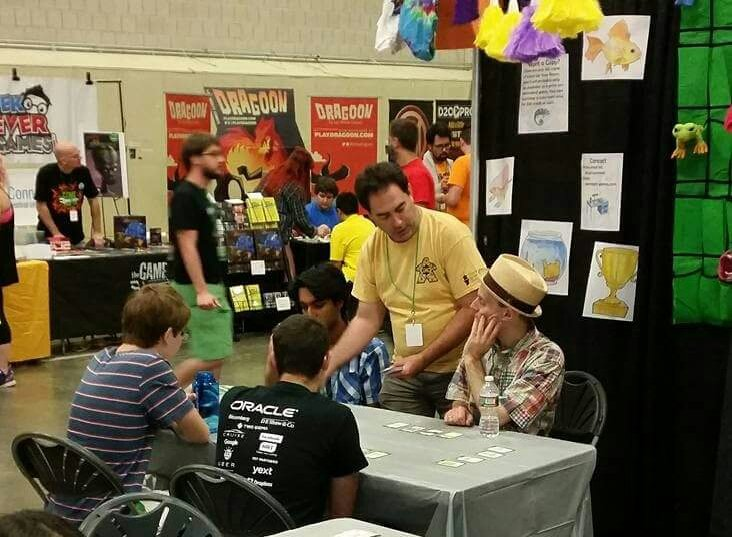 As many of you know, the Game Makers Guild is always very involved in each year’s BostonFIG. This year was no different as our members flooded the floor with their games, many of whom were in the showcase. Designers had the chance to show off their games to the public and many of them sold some, too. GMG member Dan Riles showing off his game, Clean Up Your Room! A big congrats to all designers, especially those who were nominated and won Figgie awards! Pictures can be found here. Well, this past weekend, I had an AMAZING time at Gen Con 2016! It was my first experience and I’d like to say “I did it all,” but there’s just so much to do, that’s impossible! I was showing Oh My Gods! at the Breaking Game booth, which was a blast and I met so many great people excited to play (such as those pictures below)! I also had an awesome time playing games at Nerd Night, a charity board game event that happens every Gen Con. Most of my nights were spent in the UnPub area with fellow game designers playing their games. In addition, it was amazing just to meet so many new people and make so many great friends! It was such a blast and I can’t wait to go back. This past weekend, we were present at CT-FIG, an offshoot of BostonFIG focused just on board games. IT was a blast as we got to dress up like Greek gods and show off Oh My Gods! The crowd was great and we made a lot of new fans! I also got a chance to appear of From the Hip, a podcast geared toward all things geeky, where I got to talk about OMGs and my involvement with BostonFIG. More Figgies were given out and this time, we got the “Most Spirit” Figgie, no doubt because of our amazing presence! 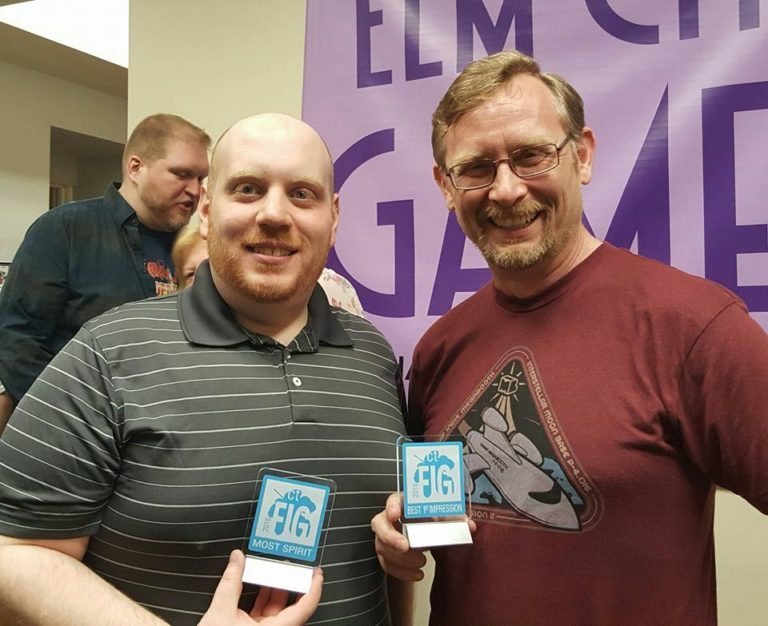 Below is me pictured with fellow Figgie-winning designer, Jeff Johnston, who got “Best First Impression” for his game, Moonquake Escape. Great news! All copies of Oh My Gods! have been delivered to backers who have completed the survey! More copies are available at the shop above! Hey there – Happy New Year to you and your family! I hope 2016 is great for you (though I know it will be – you have a great game coming soon!). Up until recently, there wasn’t much to report on OMGs, but we have some great stuff going. In other big news, on a whim, I entered OMGs into the PAX South Tabletop Showcase. I knew it was a long-shot, but figured “why not?” I knew there were going to be a lot of entries and only eight games that make it in. Well, I’m happy to say that OMGs was chosen as one of the eight! I can’t tell you how excited I am! Just more proof here that you’ll be getting a GREAT game! I’ve gotten a few inquiries about production/timeline. Honestly, there hasn’t been much to report on this end. Everything is with our manufacturer and we’re just waiting for it to be finished and shipped. I can report that the game is, indeed, being made now – like actual pieces for it are created! We’re hoping that the games leave the factory before the end of the month. They’ll then take a few weeks to arrive here in the U.S., then go out to all of you! So that’s it for now! Please remember to vote for us. And leave a comment below if you’ll be at PAX South – I’d love to meet you! Just wanted to pass on a quick update. Early last week, I approved both the proof and the privacy folio material from AdMagic and gave them the go-ahead to print! I can’t tell you how great it feels to say “Go, go, go!” They are currently working on getting me an estimated delivery date. I’ll let you know once I receive it. Hey there – just a few things! Just wanted to let you know that I received the proofs from AdMagic last week and they looked great! I sent off a few changes, so I’m waiting to hear back from them. I also received a sample of what the folios will be made out of. Whereas they looked good, I’m asking for a better finish that will be more dry erase-friendly. I will continue to work with them on this and keep you updated. Also, one of your fellow backers went to Greece recently and brought the gods with him. This is Hristos, who won an OMGs shirt at TotalCon, and wore it as he visited their old stomping grounds. I’m sure the gods were happy to be back home! That’s it for now! I’ll be in touch when I hear back about the proofs. Hey there! Quick update here. Just letting you know that the decision to switch manufacturers has been made real. Last week, I finalized things with AdMagic – and the gods couldn’t be happier! If you don’t know, AdMagic is an amazing manufacturer who does wonderful things for the indie board game scene. 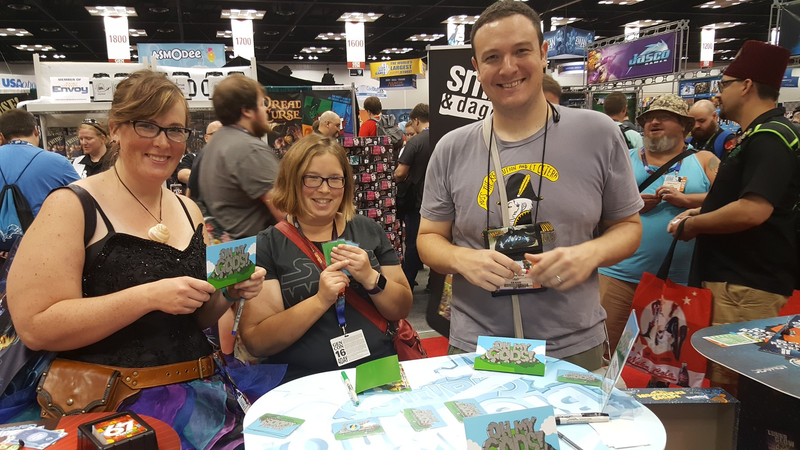 They have made many, many Kickstarter games and are a leading company in the board game world, helping to bring a number of amazing games to the public. If you’ve ever been to a big board game convention, I’m sure you’ve seen their giant booth there. I can’t tell you how happy I am to be able to announce them as our new manufacturer! At this time, I don’t have a timeline for you on manufacturing. I’m told that I’ll get a timeline once I receive the digital proofs back, so I’ll be sure to let you know as soon as I do. So far, things with them have been quick and amazing, and an all around treat. It’s been great working with them, so I trust that they’ll be on-point with everything else, too! On a side note, if you backed at the $50+ level, keep an eye on your inbox – I’ll be sending out your individual cards to give you a sneak peek at what you look like in the OMGs style! That’s it for now. Exciting things! First off, thank you SO MUCH to everyone who voted in the unofficial backer survey last month. The results are in and Screen option Number 2 was overwhelmingly chosen. This past weekend, I had a chance to showcase OMGs at the Boston Festival of Indie Games (more on that later), where we used the new screens, and we got a really good response on them. So I’m super excited to bring them to you all! Unfortunately, there have been some delays in the manufacturing process. These were, of course, not expected, and we’re working our best to push through them and get the game out to you. Given these struggles, I’ve actually been in talks with a new manufacturer, who may be opening up some new doors and, ultimately, make a better game for you. Things have not been finalized with this new manufacturer, but I’ll let you all know as soon as I do. Switching manufacturers this late in the game is not an easy process, but trust me that I would not do this if this didn’t mean a better final product for you all. I’m actually very excited about this new relationship and hope, for all of us, that it pans out. That’s right! This past weekend, Oh My Gods! was featured at the Boston Festival of Indie Games, New England’s largest indie game convention. Out of approximately 100 games that entered, half of them were selected for the showcase. In the end, Oh My Gods! got the runner-up award for Best in Show! That’s right, out of 100 games from around the U.S., we placed number TWO! 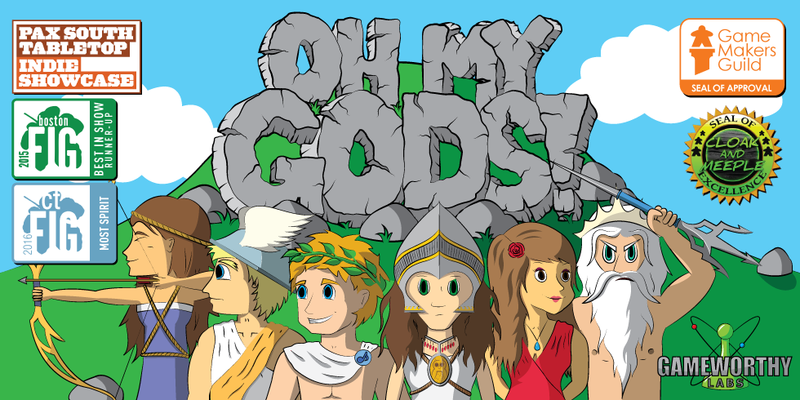 If you haven’t checked us out online yet, please feel free to follow us on Twitter (@OMGsGame) or like us on Facebook (Oh My Gods! ).